Once a favorite of locals, the park had fallen into disrepair, but will the Roman Abramovich-backed renovation price out the average Russian? The space shuttle took off on its final journey, but there were few who saw it go. 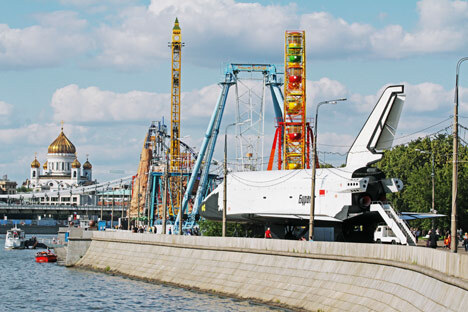 This was not the last odyssey of the Atlantis, but that of the Soviet space shuttle, the Buran. It left Gorky Park, once a crown jewel of the former Soviet Union, by boat early morning along the Moscow River. Accustomed to novelty, a few Muscovites stopped to watch the shuttle drift away from its former home. The exit of the shuttle, which had been turned into a rather lame fairground attraction in the 1990’s, was one of the first signs of an ambitious plan to spend $2 billion dollars to revive one of the few large-scale green spaces –300 acres to be exact – in the city center. The revitalization effort is backed by billionaire businessman Roman Abramovich and Moscow Mayor Sergei Sobyanin. The park, which in winter is best known for its massive outdoor ice rink, became emblematic of the Soviet Union when western readers fell in love with Martin Cruz Smith's 1981 thriller "Gorky Park." The novel opens with an atmospheric tour of the rink; three faceless and fingerless corpses are uncovered in a nearby stand of trees. The book also introduced readers to the detective Arkady Renko, who fought the corruption of the elite in a series of novels. But there was no Renko for the real park; with its rickety-looking fairground attractions, unregulated food stalls, crumbling infrastructure and overall hint of a criminal element, it had an unsavory reputation, often proving more popular with Russian and western tourists than locals. Abramovich's close aide Sergei Kapkov, who previously ran his National Academy of Football, which funded Russian football development, has been put in charge of the park and has already promised a London Eye-type wheel for Gorky instead of its current Mount Rushmore fairground ride and investment of up to $2 billion in the next two to three years with the hope of attracting up to 9 million visitors a year. The new management said that there will be a competition to find an architect to redesign the park. Some symbolic change is already noticeable. Entry to the park is now free and wi-fi is available throughout. A skateboard park has been opened and the park is planning to issue its own ice cream and reduce the asphalt that was laid in the park over the years. A summer beach has been created inside the park and a lengthy promenade will link the park to Sparrow Hills. The park, which was planned by famous Soviet avant-garde architect Konstantin Melnikov in the 1920s, was supposed to be a place for the Soviet public to relax and learn – there was a theater and a cinema – and drew crowds of Muscovites in a city which then had few places of entertainment. "It was one of the few things well run by the Soviets," said Alexei Klimenko, an independent advisor to the city. "It's a national monument but a later criminal element crept in." The current restoration plan is a priority Sobyanin, said Ilya Oskolkov-Tsentsiper of the Strelka design and architecture institute, a consultant on the project. He said the speed with which the project is moving could only happen in Moscow. "Gorky Park is bigger than Hyde Park and can be better," said Oskolkov-Tsentsiper. The comparison to London’s Hyde Park began with President Dmitry Medvedev, who appointed Sobyanin last year. Already there had been talk of a real park for the capital. "I was in London not long ago and had a look at that Hyde Park. It looks great of course. We need to speak to the Moscow powers that be and let them build their own Hyde Park," Medvedev said in 2009. The park's pathetic state is the result of more than a decade of underinvestment, corruption and exploitation. Plans to revive the park were first discussed in 2006 under then-mayor Yury Luzhkov but shelved after some expressed worries that reconstruction under Luzhkov, for whom the construction lobby was a favorite, would result in skyscrapers in the park. More than 50 of the kiosks selling fast food and other goods were illegal constructions, said Kapkov, who has had them removed in the last couple of months. A jewel of the renovation will be the restoration of the brick "Hexagon," a constructivist gem designed by Ivan Zholtovsky. Once Europe's largest cinema, it now lies in ruins. One new opening, a beach restaurant called Olive Beach, has had many asking if the redesign will price out most Russians. Kapkov said that the park has to appeal to a wide variety of people and accommodate those who already use the park, such as the J.R.R. Tolkien fans who reenact battles from the English writer’s books; the ballroom dancers who dance by the river at weekends; and the outdoor table tennis players who have been coming to the park for decades. Olive Beach was opened by Ginza Project, a restaurant group, which will be in charge of the food outlets in the park. Few if any of their current restaurants in Moscow are budget-focused, family-style restaurants, which the park also needs. Said Klimenko: "It is very important the the park should be a public zone and work in interests of society."